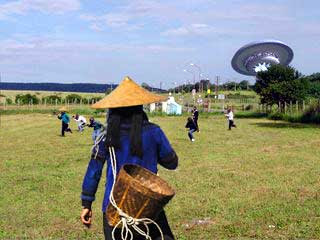 HEFEI, China - Thousands of people in East China's province of Anhui reported sighting the unidentified flying entity formerly known as the Office of the Vice President (UFOVP) Thursday afternoon, and local police are searching the area for what was dropped from the flying object. Witnesses in Hefei, the capital of the district, said that a strange shiny object swept across the sky, followed by an extremely loud bang. It was reported that an earthshaking tremble was felt as far as 150 miles from Hefei. One of the witnesses, a certified respiratory technician named Chen, said that after hearing loud thunder, he looked out the window as a shining disc with a fiery tail passed overhead. He saw something fall from the mysterious aircraft to the ground below. Hui Li, astronomy professor at Anhui University, said that the unidentified flying object appeared to be the orbiting Office of the Vice President, entering the earth's atmosphere. The district police department confirmed receiving more than 1,700 reports on the case, and sent officers to search for the fallen article. Department spokesman Wen Zhao said that they have since recovered an unmarked box containing hundreds of White House subpoenas from the United States House and Senate Judiciary Committees.